It was a quarter past one. After catching a late morning matinee at The Block's AMC, my friends and I found ourselves hungry. If we weren't lazy and famished, we would've made a beeline for the parking lot and bolted out of there to the nearest banh mi shop or burrito stand. Instead we wandered mindlessly, zombie-like, into O.C. 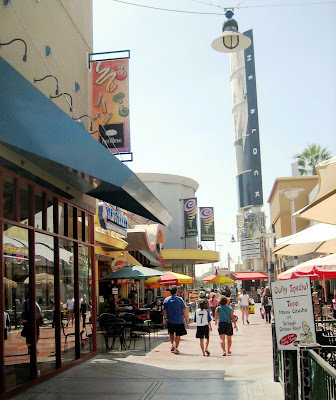 's version of the Universal City Walk food court. In the sun-drenched, gaudy alley of billboards and tourist-trappy fakeness, we ambled around dumbstruck. Then, a poster outside Pasta Bravo caught my eye. $0.99 for a slice of pizza it said. If it had to be food court food, I thought, at least it ought to be ridiculously cheap. Still, I had to be sure that there wasn't a catch. I walked in and confirmed the deal with the counter man -- an intimidating hulk with a menacing scowl that would make Seinfeld's Soup Nazi seem like Mr. Rogers. "No catch...it's just 99-cents for slice like this," he growled, pointing his gigantic sausage fingers at a lonely, dried out quarter of a pie on display. With our bellies aching, even that sad, petrified piece would've sufficed, especially for 99-cents. But when we ordered a few slices, the guy immediately went to work. 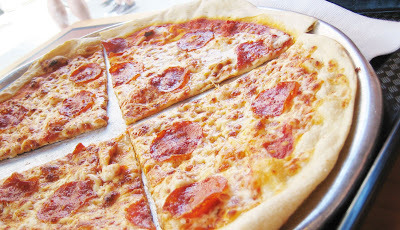 He flattened some dough onto an aluminum pie pan, spreading it thin, ladling sauce, sprinkling cheese and pepperoni, and sliding it into his oven's conveyor belt. What came out a few minutes later was cut into quarters and served bubbling lava-hot on the pan. Total for the whole pie you see above (four slices): $3.96 before tax. Very impressive that you can find a slice of pizza for 99 cents, especially in the Block! (But then again, I haven't been there since 1998, so I am not sure what the Block is like anymore.) I don't think I've ever had a slice of pizza for 99 cents, though. I think Costco's might be the cheapest that I've had! "the best 99-cent pizza you've ever had." It would have been even better if the cheese wasn't burned so much on the top. But, I admit, the dough does look fresh, and that's half of what makes a good slice right there. That 99 cent slice sounds/looks wonderful. You are making me hungry for pizza ! I was just as surprised! And you know I eat Costco's pizzas all the time. A great deal for $1.99 -- lots of toppings and a hearty crust. But since these are wafer thin, I love them even more. Two, coincidentally, amounts to the same weight as one Costco slice. Oh I remember those days. Pizza! Pizza! I can honestly say it has been at least a decade since I had Little Ceasars. Even at the time, I never liked them. Especially the pieces in the middle of the square...no crust! HA! I did stop short of saying that it was the "best" pizza I've ever had. Though it was pretty damned close. The picture didn't do it justice though. I think the bright backlight made it look like it was more burnt (and darker) than it was. Thanks! And really, anything that is 99-cents should be immune to criticism...but I'm not kidding, I loved the pizza! .99 cent I am sold! These days, with even the 99-Cent-Only store thinking of raising their prices, you gotta grab onto any deal like this! 99 cents? Oh man I am SO THERE. cheap is actually a flavor it's a bit mysterious, kinda like umami. but it makes even the crappiest food taste better. 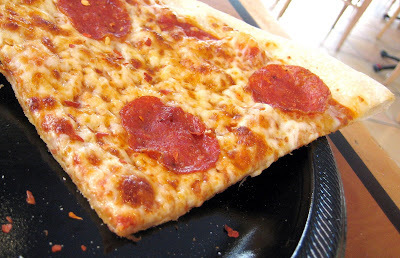 99cents can make cardboard with cheese and pepperoni taste like a little bit of little italy. Might have to chow down on some of that this weekend, in between the Orange International Street Fair and going to see Tropic Thunder. Ah! A fellow chea__I mean, bargain hunter! You always find an angle I never thought of! Cheap *is* a flavor! Better than MSG! Believe it or not, this 99-cent pizza is actually a cure for movie ticket sticker shock!